Green works for the planet. Green works for your business. Green cleaning — cleaning to protect health without harming the environment — is in the best interests of the eco-system, your business and your employees. Green business ideas and green business initiatives are quickly becoming a normal part of everyday business, making it imperative that businesses develop and implement their own green policies and start doing their part to create a "carbon-neutral" business. One easy eco-friendly measure that can have a significant impact is using green cleaning products that eliminate harmful and toxic chemicals. There are now many eco-friendly solutions available for use with laundry, on specific needs like grease and stains, and other heavy-duty industrial cleaning jobs. 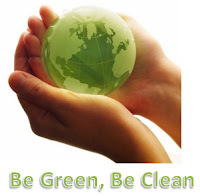 Whether you are just cleaning your office, your restaurant kitchen facility or a manufacturing plant, using natural cleaning products not only allows your business to do its part in helping to improve the environment, it allows your building management team to make a statement that they care first and foremost about their customers and staff. A recent survey* showed that seven out of 10 consumers prefer to patronize a business that demonstrates a commitment to the environment. When it comes to cleaning, 68 percent of business owners would prefer for their business to be cleaned with green products, and 78 percent of office workers agree that, when possible, businesses should use green cleaners instead of conventional ones. "Today's business owners want green cleaning that's also effective," added Grabowski. "And when it comes to powerful clean, the brands they trust are Green Works and Clorox." 58% of cleaning professionals prefer to clean with Green Works® products over conventional cleaners. Going green does work for the planet and for your business. By providing all-natural cleaning products for your employees, you improve their health, productivity, retention and morale. That translates into real financial savings over time. *Vatoca Partners Survey, February 2009. Why they work and what you should know to maximize their effectiveness. Not only are there differences in the action of the antimicrobial ingredients, but there are also differences depending on the concentration of chemical that is used that can impact the action of a chemical agent or physical process. In general, disinfectants have three mechanisms of action or ways that they affect or kill an organism: Cross-linking, coagulating, clumping; structure and function disruption; and oxidizing. Mechanism of action: Cross-linking, coagulating, clumping. Like many disinfectants, alcohols are generally considered to be non-specific antimicrobials because of their many toxic effects. Alcohols cause cell proteins to clump and lose their function. Specifically, the cell membranes lose their structure and collapse, thereby killing it. The alcohol must be diluted with water for the optimum effect, as proteins are not denatured as readily with straight alcohol. Alcohol is also effective in inhibiting spore germination by affecting the enzymes necessary for germination. However, once it's removed, spores can recover, so it's not considered a sporicidal. Chlorine is a very common disinfectant used in a wide variety of cleaning solutions and applications — even in drinking water — because, even in very small amounts, it exhibits fast bactericidal action. Chlorine works by oxidizing proteins, lipids and carbohydrates. Hypochlorous acid, which is a weak acid that forms when chlorine is dissolved in water, has the most effect on the bacterial cell, targeting some key metabolic enzymes and destroying the organism. Chlorine compounds have also been shown to affect surface antigen in enveloped viruses and deoxyribonucleic acid (DNA) as well as structural alterations in non-enveloped viruses. Very few chemicals are considered sporicidal; however, chlorine compounds in higher concentrations have been shown to kill bacterial spores such as Clostridium difficile (C. diff). Both hydrogen peroxide and peracetic acid are peroxygen compounds of great importance in infection control because, unlike like most disinfectants, they are unaffected by the addition of organic matter and salts. In addition, the formation of the hydroxyl radical, a highly reactive ion that occurs as peroxygen compounds encounter air, is lethal to many species of bacteria because it is a strong oxidant. Being highly reactive, the hydroxyl radical attacks essential cell components and cell membranes, causing them to collapse. Peroxygen compounds also kill spores by removing proteins from the spore coat, exposing its core to the lethal disinfectant. Phenol and its derivatives exhibit several types of bactericidal action. At higher concentrations, the compounds penetrate and disrupt the cell wall and make the cell proteins fall out of suspension. One of the first things to occur is stopping essential enzymes. The next level in the damage to the bacteria is the loss in the membrane's ability to act as a barrier to physical or chemical attack. Though phenols can act at the germination — beginning of growth — stage of bacterial spore development, this effect is reversible, making them unsuitable as sporicides. Mechanism of action: Structure and function disruption. Quaternary ammonium compounds (quats) are some of the most widely used disinfectants today because of their broad spectrum effectiveness. Quaternary ammonium compounds work by denaturing the proteins of the bacterial or fungal cell, affecting the metabolic reactions of the cell and causing vital substances to leak out of the cell, causing death. Because quats are a charged particle, something to consider is "quat absorption," which is when quat molecules are attracted and bound to anionic — negatively charged — fabric surfaces. For example, if a pail contains the correct dilution of a disinfectant with an active ingredient concentration of 800 parts per million (PPM), that concentration could be reduced by as much as half after a cotton wipe is placed in the solution and allowed to soak for 10 minutes. Some ways to solve quat absorption include using wipes made from nonreactive textiles and increasing the solution concentration to compensate for absorption. While each of the chemicals described above are effective in certain applications, formulations are also made more or less effective by their other ingredients. In particular, surfactants are often important ingredients to disinfectant cleaning solutions because they achieve uniform wetting of surfaces and frequently help with cleaning. Something to consider is that some surfactants contain positively-charged ions, which can inactivate negatively-charged antimicrobials like quaternary ammonium compounds by binding with them, making them less effective against a microbe. In contrast, low surfactant concentrations may improve the microbiocidal effect. The reason for the improved action is thought to be an accumulation of the agent within micelles of the surfactant, which absorb to the microorganism's cell wall. The active substance thus becomes enriched at the cell wall, which means that a lower dose is required for the desired effect. While chemistry is important, even the best formulations will not be effective if applied incorrectly or inconsistently. Other processes and interventions must also be in place to ensure that all areas are cleaned thoroughly each time. Understanding how different chemistries work can help you evaluate which ones are best suited to your facilities' needs.